Coach David Quinn officially announced BU’s 2013 recruit class featuring six forwards and four defensemen today. The group includes nine freshmen and one transfer. The transfer is 6-6, right-shot defenseman J.D. Carrabino, who played three games for Clarkson last season after red-shirting in 2011-12. He’ll practice with the team this season and have two years of eligibility beginning in fall 2014. ● Doyle Somerby a 6-6 left-shot and 2012 Islander 5th round draft choice, who captained Kimball Union last season—earning NEPSIHA all-star honors—before playing ten games in the USHL with Muskegon. 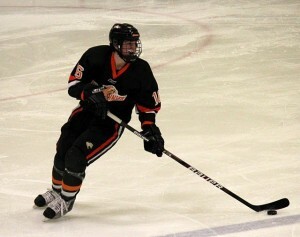 A shutdown defenseman, he also led KUA blueliners in scoring this past season with a 3-18-21 line. As a junior he helped the Wildcats to a prep championship. 2012 interview. ● TJ Ryan, 6-0 right shot from the South Shore Kings and Newton North, where he was a five-time captain (hockey, golf, lacrosse) and was recognized as the school’s top athlete. His father, Tom, provides analysis on BU hockey broadcasts and shared the captaincy of the 1987-88 Terriers with Quinn. ● Robbie Baillargeon, a 6-0, right-shot center, who spent the past two season in the USHL, scoring 89 points, after two campaigns at Cushing Academy, where has was USHR Prep Forward of the Year in 2010-11. A #5 draft pick of Ottawa in 2012. 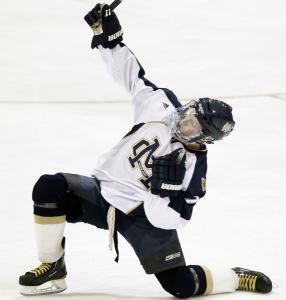 ● Brendan Collier, a 5-9 left wing who played for the EJHL Valley Jr. Warriors last season after two standout seasons at Malden Catholic, leading the Lancers to back-to-back state titles. Named ESPN Boston's Mr. Hockey after scoring 65 points in 2011-12. Collier grew up playing with close friend Matt Grzelcyk in the Middlesex Islanders organization and later the N.E. Nordiques summer tournament program. A #7 pick by Carolina in 2012. ●Kevin Duane, a 6-5 right wing, who split time between the USHL and EJHL last season, scoring 13 goals and 15 assists in 25 games for the Jr. Bruins. Had two seasons as a top scorer at The Brunswick School, including 29-24-53 in 2011-12. ● Dillon Lawrence, a 6-3 left-shot center, who played for the AAA Major Midget Toronto Nationals, with a 15-21-36 scoring line in 33 regular-season games and 3-4-7 in ten playoff games. Played in last season’s GTHL Midget All-Star game and was his team’s recipient of the 2013 Gretzky Award for combined academics and on-ice performance. Click here and then on each player’s name for individual stats from recent seasons. 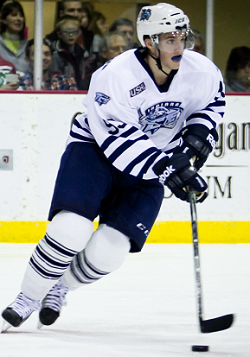 ►OverTheBoards.com recently revealed its recruit class rankings and pegged the Terriers’ class at #5 in the nation. OTB recently posted its analysis of BU’s current recruit class as well as several other verbals in the pipeline. 2014 recruits goalie Shane Starrett and right wing J.J. Piccinich participated in the inaugural USHL Atlantic Challenge in New Jersey this past weekend, skating for Sioux Falls and Youngstown respectively. The event was heavily attend by college coaches, including BU associate head coach Steve Greeley and former Terrier captain Joe Pereira, now an assistant at UConn, along with numerous NHL scouts.